A group of more than 50 students, led by Students for a Democratic Society (SDS), took over the first floor of Coffman Memorial Union, the University of Minnesota’s student center, for a public demonstration and teach-in on issues of inequalities in education mid-day on Nov. 9. The “Driven to Disparities” teach-in was organized by SDS to educate students about the ongoing struggles and campaigns to address misogyny, Islamophobia, xenophobia, racial and national oppression, and economic inequalities on campus, all issues exacerbated by the election of the racist right-wing populist Donald Trump to president of the U.S. the previous day. In the run up to the election, Muslim students and nonwhite students have been targeted and increasingly harassed by Trump supporters at the U of MN. Students for Justice in Palestine (SJP) was the target of a smear campaign that labeled them anti-Semitic and terroristic and the Muslim Student Association had its logo on campus vandalized with a spray painted “ISIS.” The Nov. 9 SDS teach-in rallied progressive students to occupy space in Coffman and oppose these local manifestations of the Trump agenda at the U of MN. Speakers from SDS, the Feminist Student Activist Collective (FSAC), Whose Diversity?, Adelante!, Differences Organized (DO), Students for Justice in Palestine (SJP), and Student Workers for $15 all addressed the actions they are taking to mobilize students for a progressive agenda. In particular, students called for the administration of U of MN President Eric Kaler to be replaced, and for him to be fired. 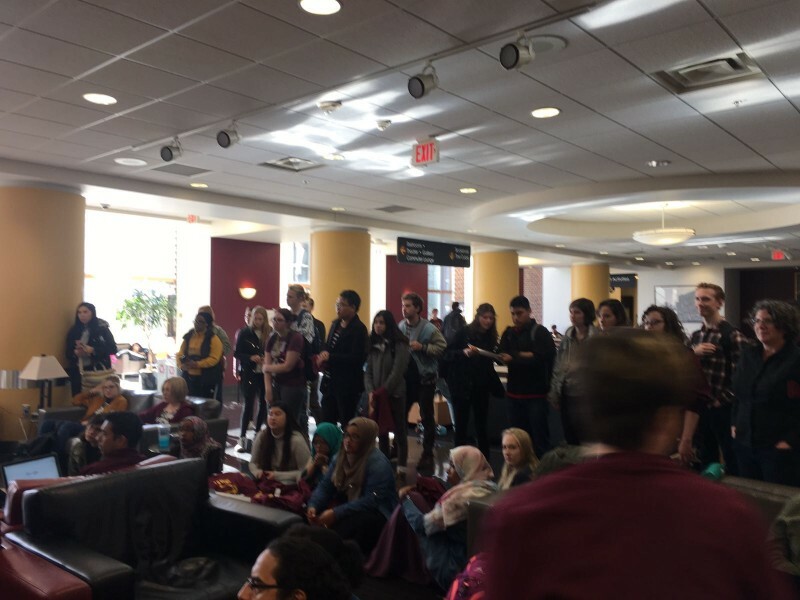 Students wore “Fire Kaler” t-shirts and chanted “Chop, chop, chop from the top” and “Fire Kaler” inside the student union during the teach-in. For many in attendance, Kaler’s inability to prevent, or to fully condemn, hate speech on campus by Trump supporters is a line in the sand that shows he cannot govern what the protesters believe should be a politically progressive campus. Kaler has also been implicated in a number of high-profile scandals in recent years and pushed for expanded corporatization of the University of Minnesota system, leading many other voices, including former Minnesota governor Arne Carlson, to echo the students’ call for Kaler to be fired. Protesters also demanded that tuition be lowered, called for the U of MN to better serve underrepresented communities of color, for the divestment of university funds from corporations profiting off of Palestinian occupation, for the permanent funding and support for cultural centers on campus, for criminal charges against student protesters to be dropped, and for living wages for campus workers. To continue pressing for these demands, Students for a Democratic Society (SDS) asked those in attendance to join them on Dec. 9t for an action at the next U of MN Board of Regents meeting. Join us for a teach-in in the public space of Coffman concerning student perspectives on the contradictions of campus life and struggle amidst skyrocketing tuition, increasing inaccessability and repression of student voices by Eric Kaler and his bloated, over-paid administration. CALL-IN TO THE MPLS CITY ATTORNEY TO DEMAND: DROP THE CHARGES AGAINST STUDENT ACTIVISTS! DO! members who were arrested at the BOR meeting on June 10 are awaiting trial set to occur mid-December. We know that we’re in the middle of the semester and things are getting busy, but please take a moment to write or call into the city attorney’s office asking them to drop the charges against the 6 students who were arrested at the Board of Regents meeting on June 10. Please express your support of the right to protest and condemn the criminalization of student protest.